POSCO created ‘Corporate Citizenship Volunteer Service Award’ as a way to implement its vision — mutual growth with corporate citizenship. The award is set to become annual, and the award recipients will be chosen not only from within the POSCO group and subsidiaries, but also from its partners as well as various philanthropic organizations from across Korea. The company will apply comprehensive standards to evaluate the potential recipients such as their contribution, the voluntary participation of the employees, talent contribution and the level of involvement for its 1% Foundation. This is the first time POSCO is awarding an external organization in the field of philanthropy. On Jan 31st at the POSCO Center, the first award ceremony was held for the ‘Corporate Citizenship Volunteer Service Award.’ Six recipients received recognition for their philanthropic efforts: a Pohang-based organization, ‘The Joy Welfare Foundation,’ POSCO Volunteers for Clean Ocean from Pohang Works, Gwangyang Works Firefly Volunteer Team, volunteer groups from POSCO’s subsidiaries eNtoB and POSCO-Mexico’s POSAMI as well as POSCO’s partner company, UniTech. Along with the recognition, the awardees received the cash prize of approximately $31,000. The Joy Welfare Foundation who has been partnering with POSCO since 2009 created and offered job opportunities for the underprivileged families of multicultural backgrounds in Pohang. The Foundation also proactively supported domestic violence survivors as well as the elderly single-member households, and POSCO recognized the foundation’s contribution announcing the organization as the first award recipient outside the POSCO group. 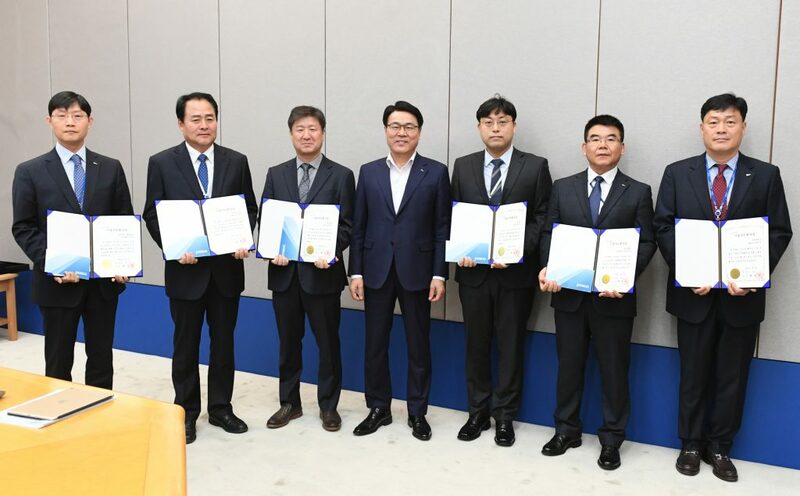 On the same day, POSCO further addressed the concept and the implementation measures of corporate citizenship through the group’s steering committee. According to the company, POSCO’s corporate citizen identity surpasses that of an economic entity. It involves that of conscientious citizen proactively seeking to solve community issues, which will ultimately boost the company’s values and credibility. POSCO specifically highlighted the importance of the corporate citizenship mindset in all implementation and decision-making processes. The company will develop a corporate citizenship training curriculum providing detailed guidelines on the action plans for the employees. POSCO’s 1% Foundation will also rearrange its programs to increase donor participation and to which employees can build strong dedication. The volunteer programs will focus on adding practical values to the community through the employees’ talent contribution. POSCO is also striving to address Korea’s all-time low fertility rate and high youth unemployment rate – the company will come up with specific programs to undertake the issues which the company will announce in the coming days.